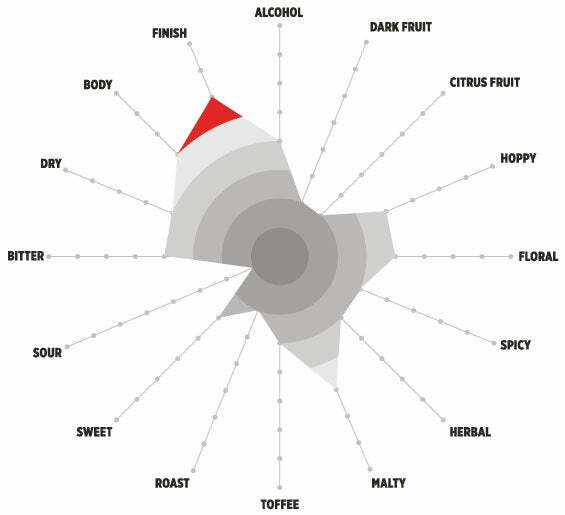 Most brewers put their stock squarely in science. A few may say luck plays a role. But how many of us brew beer shaped by the hand of fate? It’s hard to believe, but one of London’s fastest-growing, most iconic craft breweries owes its start to one missed flight…and the thirst for adventure that runs deep in Camden Town Brewery’s founder, Jasper Cuppaidge. When Cuppaidge was on his way home to Australia from a surfing trip, he missed a connecting flight and found himself in London. And there he stayed, taking up odd jobs in a local pub to enjoy the city’s one-of-a-kind energy. Years later, he opened his own pub, and soon started brewing family beer recipes in the basement to offer his friends and fellow pub-owners an alternative to the British standards that had been filling pints for centuries. Those beers – specifically the lager now known as Camden Town’s flagship Hells -- quickly proved too big for the basement. And in 2010, Camden Town Brewery opened in the shadow of the now-iconic North London railway arches. Within only five years, Camden Town grew to become one of the largest craft breweries in the UK, specializing in classic beer styles, exclusive European brewing ingredients and a hefty dose of experimentation. In addition to “Raising Hells,” fans look forward to Camden Town’s always-exciting, limited-run seasonal brews. And none more so than Camden Town’s Flue Faker Smoked Lager. 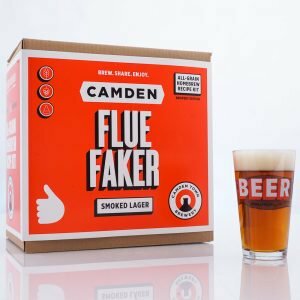 A twist on the classic German Rauchbier, Camden Town’s Flue Faker takes a more understated approach to this centuries-old smoked lager style. It’s brewed to convey just a whiff of woodsmoke, balanced with hints of bacon and toast and finishes crisp and refreshing, like any great lager. The secret is in the smoked malt, which Camden Town sources directly from Bamberg, Germany – celebrated home of the Rauchbier. And that’s the foundation for this homebrewing recipe kit, as well: a backbone of traditional smoked beech malt, direct from Bamberg, scaled just for homebrewers to deliver just the right hint of smoky flavor. Sound amazing? Wait until you taste it. Actually, don’t wait. Rauchbier is the perfect brew for any grilled or smoked fare, and if you want to be fully stocked and ready for BBQ season, now’s the time to brew this exclusive, limited run Camden Town seasonal. Here’s everything you need to know to get started. We think Flue Faker pairs with just about everything. But here’s a good guide for those seeking the perfect fare to highlight the beer’s subtle smoke: If you’d eat it with bacon on top, or cook it outside, it’s a match. Think juicy burgers, smoked meat or fish, grilled veggies and fire-roasted everything. Flue Faker’s balanced smokiness also pairs well with tangy cheeses and umami-rich foods like mushrooms. And don’t rule out desserts…the caramelized sweetness of most fruit pies is a perfect match for the subtle smoke of Flue Faker. Camden Town’s founder and brewmaster Jasper Cuppaidge comes from a brewing family, albeit one with roots on the other side of the world. He grew up in Australia, where his grandfather ran a local pub and brewery called McLaughlin’s. In 2008, when Jasper set up shop in Hampstead with his own pub, called the Horseshoe, he couldn’t quite find local beers he loved. So he started brewing his own, in the Horseshoe’s basement, inspired by his grandfather’s recipes. At first, he shared them only with fellow pub owners and friends. But demand soon outpaced his basement space, and in 2010 Jasper started building a brewery big enough to craft the lagers he loved properly. 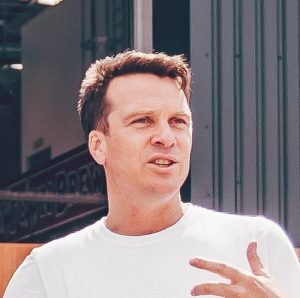 In just five years, Camden Town Brewery grew from a team of two to become one of the largest craft breweries in the UK, now almost 100 strong. What’s the story behind Flue Faker? Who created the recipe and what makes it so special? Flue Faker comes from Bamberg – the same place as our base Pilsner malt. When we travel out there to meet our maltsters we always end up in the breweries and bars out there drinking great rauchbier and we wanted to show others just how wonderful and unique this style of beer can be. Do you have any tips for homebrewers? Either for brewing Flue Faker or in general? Be kind to yourself! Brewing – particularly homebrewing – is really hard work. Enjoy what you’ve created and remember that making beer is probably the closest you’ll get to doing magic. Like our home in Camden Town, London, our brewery has a whole lot of diverse music tastes. You’ll often find the brewers fighting over what to play. I like the White Stripes myself. What’s a great day like at Camden Town? The best day is always Friday. Not because it’s the start of the weekend – we have lots of guys working Saturdays – but because we all eat a big take out lunch together, have desk beers at 5pm and catch up in our Brewery Bar after work to enjoy the fruits of our labor. What are your favorite beers in the world (aside from your own)? Too many to count! But I’ll always have a place in my heart for the traditional German lager breweries that inspired our flagship lager, Hells. There was one in particular called Tegernseer Hell, brewed just south of Munich, which has a great malt profile and depth but you can drink them all night. Camden Town was at the forefront of the London craft scene. Now that the region has so many breweries, what do you do to ensure you stay at the front of the pack? We’re one of the few breweries that specializes in lager, so that will always mean we’re travelling a slightly different path. Having so many other breweries in London is great, it keeps us on our toes and means we’re always innovating. What’s something few people know about Camden Town? There’s a castle in our logo and that represents the fact that there’s four castle pubs in our borough in London. Years ago, when the big railway stations were being built in North London, people from all over the UK came together to work on the tracks. But then, at night and after a few pints, they’d fight. So a pub was built for each home nation: The Windsor Castle, The Pembroke Castle, The Edinburgh Castle and The Dublin Castle. We added a new castle to bring all the drinkers back together again. Getting to drink the beer with others ¬– and seeing people drink it with friends – and knowing it tastes great. That’s why we started Camden. Camden Town is known for its vibrant culture and sometime volatile history. We’re not sure how much of that influences the brewery’s beers. But we do know this: Our Brew. Share. Enjoy.® Brewery Edition Kit is the next best thing to an all-access brew day at Camden Town’s new, state-of-the-art brewery. We’ve worked alongside Brewmaster Jasper Cuppaidge to scale his authentic recipe just for homebrewers, so you’re guaranteed a pint that tastes just like one pulled from the tap in the brewery itself.